Before diving in head-first to football coaching, it’s important to know what works and what fails miserably. 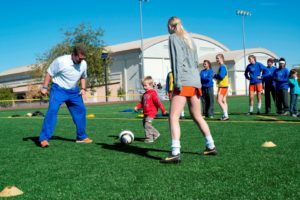 Here are some more coaching tips to make it an enjoyable and worthwhile experience for all involved. If you are trying to teach a new skill, don’t be afraid to ask others to demonstrate if you can’t do it yourself. There’s no shame in asking an assistant to help. After all, your job is to coach the kids and help them improve, not to show them a bad attempt at what they should be learning. This can be tricky, especially if you have players who are much more skilled than others. However, giving each child equal playing time is something that the F.A are even incorporating into their training modules for junior football. Winning is great, but encouraging development and building self-esteem is more important. Logging information is a great way to keep track of important match facts. Keep track of minutes played, substitutes, goals and reprimands so you are able to back up your information when giving feedback. 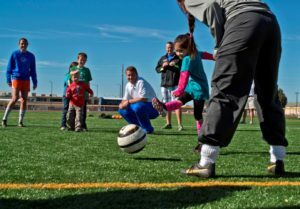 It can be hard to coach when there are several parents who want to talk to you about their child’s performance. Appointing a parent representative to answer common questions allows you to focus on doing your job. They can also communicate with parents for issues such a replacement football team kits like those found at https://www.kitking.co.uk/ and help brainstorm ways to raise the money needed. If you lead by example, your players are more likely to follow suit. This means showing respect to other teams, parents and officials, even if you do not always agree with their decision. Are you more likely to be motivated to work hard if you are criticised or praised for your actions? Being positive can help to create a calm, safe environment, which can help you to gain respect. Of course, feedback is not always nice. In that case, try to use the “praise, criticise, praise” technique to keep it positive. Don’t bombard your team with too much feedback. Your team is less likely to take it in if you are constantly over-coaching, so try to keep it simple by summing it up before moving on.